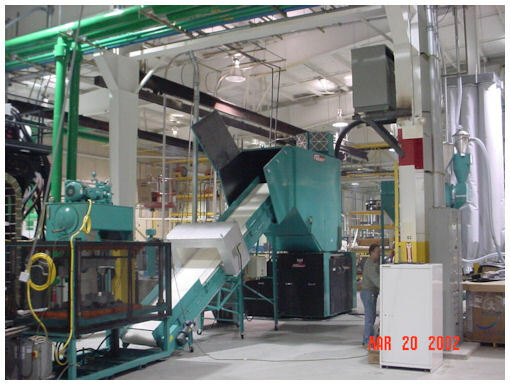 High Volume Granulators – 3030, 3036, 3045 – Foremost Machine Builders, Inc.
Our High Volume Granulators are designed specifically for beside-the-press operation. These machines are constructed of heavy gauge steel throughout, with the cutting chamber a rigid one piece weldment. Foremost’s new 30″ X 30″ large barrel grinder is intended for pit mounting and features an over 1000 lb flywheel, pneumatically operated feed control with direct vertical drop, and numerous servicing convenience features. The rotor in the 3030 granulator, a massive open weldment, has six staggered fly knives. Outboard isolated pillow block bearings with 6″ journals, a 32″ 1067 lb steel flywheeel and a seperate drive sheave using five belts complete the drive system. The staggered rotor knife design results in more positive, uniform< feeding, smoother operation and a better distribution of impact stresses. 3 bladed heavy duty high shear. Controls: NEMA 12, 110 volt control panel with fused disconnect and all starters electrically interlocked.